“Truth On The Line” is a Pan Left Production written and directed by Steev Hise. 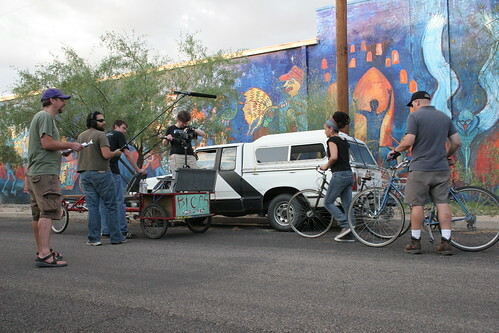 First conceptualized as a TV pilot in 2008, the film was shot in summer 2009, featuring several Pan Left members as crew and cast. After a long post-production period, it’s now being released as a 6-part web mini-series on Vimeo.The first webisode went live on Thursday, October 18, the second one the following Monday, and the third has just been made available today. The remaining installments will go up on Mondays and Thursdays over the next week and a half. Truth On The Line is a fictional story, but it contains many situations, issues, and people that are based on reality, and will be readily familiar to many who live in southern Arizona or who follow the national debate about immigration and the border. The story of TOTL centers around the staff of a TV news program called News On The Line as they engage in the daily struggle to produce quality journalism and inform the public about immigration and border issues. Stan, one of the anchors of the program, wants to change the way they do things, but there’s considerable organizational inertia and worries about funding. Meanwhile there’s other mediamakers in town who have their own way of reporting the news.